The Elliot pecans in this bag are known by foodies and chefs alike for their signature sweet flavor, high oil content, and natural buttery crunch. This plump, round nut is a pecan unlike any other pecan you’ve ever tasted. Only a handful of growers have them planted, so their limited supply makes them a treat worth savoring. The Elliot pecan is named after Henry Elliot, the gentlemen who discovered this specific variety growing on his farm in the Florida panhandle in the 1910’s. The Elliot is known as one of the most disease-resistant pecan trees that grow in the Southeastern United States. You’ll immediately notice that size and shape of the Elliot pecan lends itself perfectly for cooking and baking as it requires no chopping. Simply add Elliot halves to your salads, cookies, and pies, and enjoy their amazing flavor. Genuine Georgia is a collection of 5th generation farmers who grow and shell the amazing Elliot pecan. We’re based out of Fort Valley, Georgia, and our families are directly involved in every step of the process: from planting and fertilizing the orchards to growing and irrigating the trees, from harvesting and cleaning the nuts in a state-of-the-art cleaning facility, and from shelling the pecans to packaging the Elliots for sale. 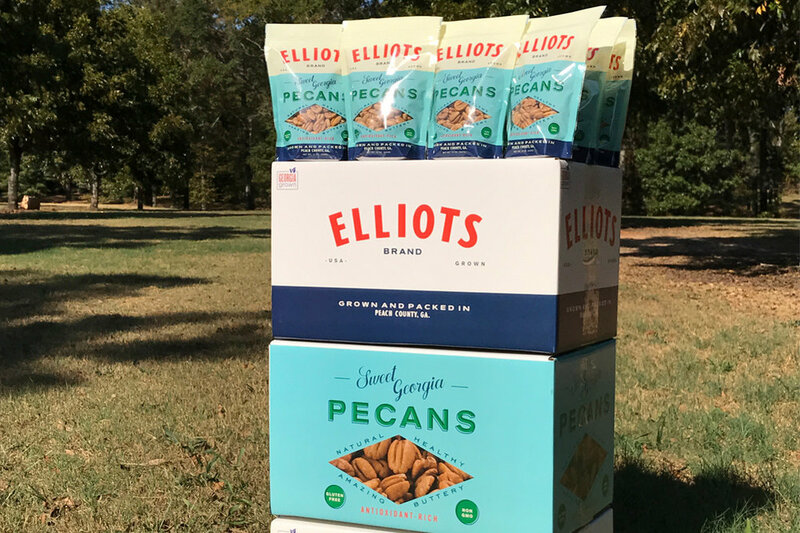 Elliot pecans are shelled and packaged in a PEANUT-FREE FACILITY! The Elliot pecan is the undisputed KING OF FLAVOR! Packed with more oil than any other pecan, the Elliot is naturally sweet. It doesn’t need to be coated with salt or rolled in sugar to be delicious. The natural flavors of most other nuts are constantly being masked by additional ingredients. Toasted and salted pistachios. Honey roasted almonds. Elliots do not need anything but itself. We guarantee you’ve never tasted a fresh pecan like the Elliot. Elliots are packed with ANTIOXIDANTS! In fact, pecans have the highest value of antioxidants per serving. Why are antioxidants so important? Because they “clean up” and help neutralize free radicals floating around in your body. These free radicals contribute directly to the aging process and horrible diseases such as cancer, diabetes, and heart disease. A diet rich in antioxidants is ideal in fighting off these diseases. The antioxidant values of foods are best expressed in Oxygen Radical Absorbance Capacity (ORAC) units, a unit of measurement for antioxidants developed by USDA’s National Institutes of Health (NIH) and National Institute on Aging (NIA).